You won’t want to miss hostess Honey LaBronx from New York City! Honey is a dedicated activist for the animals, and has performed around the world raising funds for animal sanctuaries and animal rescues. Drag Queen Bingo will take place in a much smaller venue than in previous years. The cozier environment will create a more exclusive experience for attendees and boost chances of winning an exciting prize! Reserved tables are also available to ensure that you and your friends get to sit together at some of the best seats in the house. 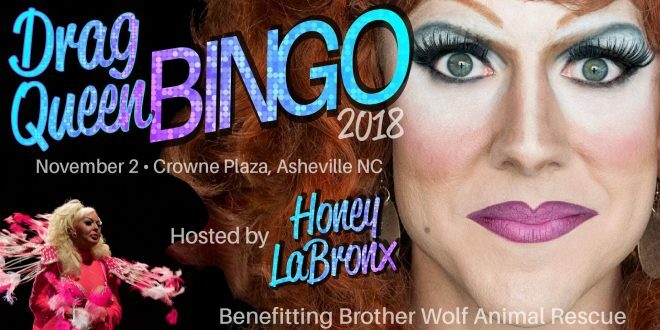 Drag Queen Bingo was voted WNC’s Best Fundraising Event in 2017 by Mountain Xpress! Visit dragqueens.bwar.org to purchase your tickets today. All proceeds from Drag Queen Bingo benefit the thousands of animals Brother Wolf will rescue and care for this year, including the animals rescued from areas affected by Hurricanes Florence and Michael. Since Brother Wolf receives no government funding for their work, events like this help to make their life saving work possible.